Here we are in 2015 with a fantastic digital audio resource about the island from the Jura Lives project, and Mr Danilo Giglitto, PhD student from Aberdeen university wanting to feature us in his thesis about intangible heritage – namely by building a wikipedia just for Jura, the jurapedia. It seems to the JDT that we have an opportunity to be better safeguarding and using our heritage to make an impact into the future and onto a potentially global audience. The first step is to provide access to more of our heritage content online and through people’s personal devices. To this end, we are thinking of harnessing Danilo’s work, combining it with some of our own content, and sharing the digital love here on the island through a new initiative going under the banner of ‘the Jura Time Machine’. You can read more about what assets and activities the Jura Time Machine would aim to deliver in this provisional . During March 2015 we will be starting a crowd-funding campaign with the aim of kickstarting this work on our digital heritage. 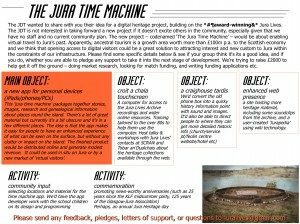 Watch this space and you will be able to make a pledge to help get the Jura Time Machine off the ground! ← Vote for the Jura Community Shop to win!